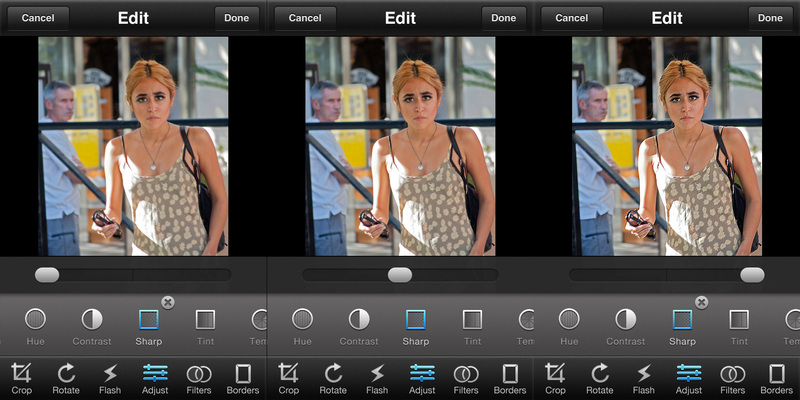 Quick Roll design for selecting which photos to Edit, Share, Sync, Tag, etc. Flash: Off/On (for the 4 & 4S); this feature changes to “Soft Flash” for iPhone 3GS and Touch 4G. Resolution (Original [3264×2448]; Medium [1632×1224]; Low [816×612]) – NOTE: these resolutions for the iPhone4S, each different hardware model supported by this app has a different set of resolutions set by the sensor. Essentially it is Full, Half and Quarter resolution. The exact numbers for each model are in the manual. A set of 18 filters that can be applied before taking your shot, as opposed to adding a filter after the shot during Editing. 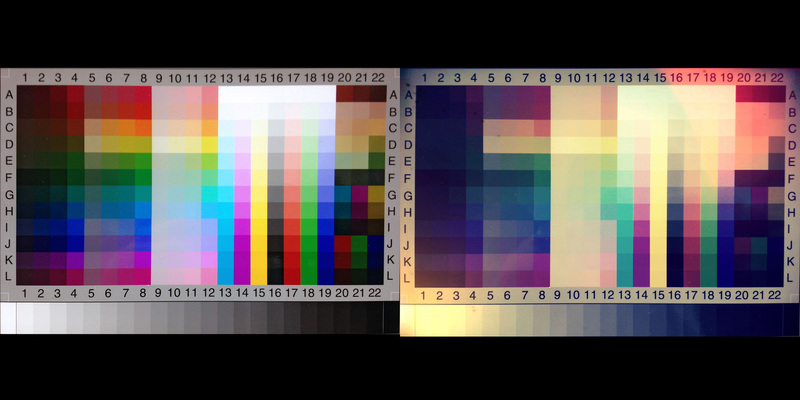 The pixel resolution stays the same whether the filter is on or off (3264×2448 in the case of the iPhone4S). While the Live Filter function is fully active during preview of an image, once you take the shot there is a delay of about 3 seconds while the filtering is actually applied to the image. Some moving icons on the screen notify the user. Remember that the screen is 960×640 while the full image is 3264×2448 (13 X larger!) so it takes a few seconds to filter all those additional pixels. This does mean that when using Live Filter you can’t use Burst Mode (it is turned off when you turn on a Live Filter), and you can’t shoot that rapidly. Although the pixel dimensions are unchanged, the size of the image file is noticeably smaller when using Live Filters than when not. This can only mean that the jpeg compression ratio is higher (same amount of input data; smaller output data; compression ratio mathematically must be higher). I first noticed this when I went to email myself a full resolution image from my phone to my laptop [faster for one or two pix than syncing with iTunes] as I’m researching for this blog – the images were on average 1.7MB instead of the 2.7MB average for normal iPhone shots. I tested against four other camera apps, including the native Camera app from Apple, and all of them delivered images averaging 2.7MB per image. I then tested this app (Camera Plus Pro) in Unfiltered mode, and the size of the output file jumps up to an average of 2.3MB per image. Not as high as most of the others, but 35% larger. Therefore a 35% reduction in compression ratio. I’ll run some more objective tests during the filter analysis section below, but both in file size and visual observation, the images appear more highly compressed. This does not mean that a more compressed picture is inferior, or softer, etc. – it is highly dependent on subject material, lighting, etc. But, what is true is that a more highly compressed picture will tend to show artifacts more easily in difficult parts of the frame than will the same image at a lower compression ratio. The basic use and function of the camera is addressed in the manual, what I will discuss here are the Live Filters. I have run a series of tests to attempt to illustrate the use of the filters, and provide some basic analysis of each filter to help the user understand how the image will be affected by the filter choice. The resolution of the image is not reduced by the use of a Live Filter – in my case (testing with iPhone4S) the resultant images are still 3264×2448 – native resolution. 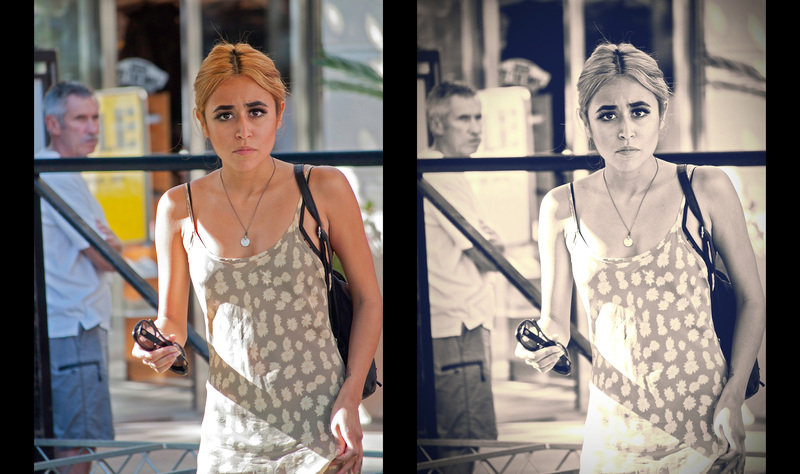 There are of course the effects of the filter, which in some cases can reduce apparent sharpness, etc. Firstly: my standard test images that I use to analyze filters/scenes/etc for any iPhone camera app consists of two initial test images: a technical image (calibrated color and grayscale image), and a ‘real-world’ image – a photo I shot of a woman in the foreground with a slightly out-of-focus background. The shot has a wide range of lighting, color, a large amount of skin tone for judging how a given filter changes that important parameter, and a fairly wide exposure range. The original source for the calibration chart was a precision 35mm slide (Kodak Q60, Ektachrome) that was scanned on a Nikon Super Coolscan 5000ED using Silverfast custom scanner software. 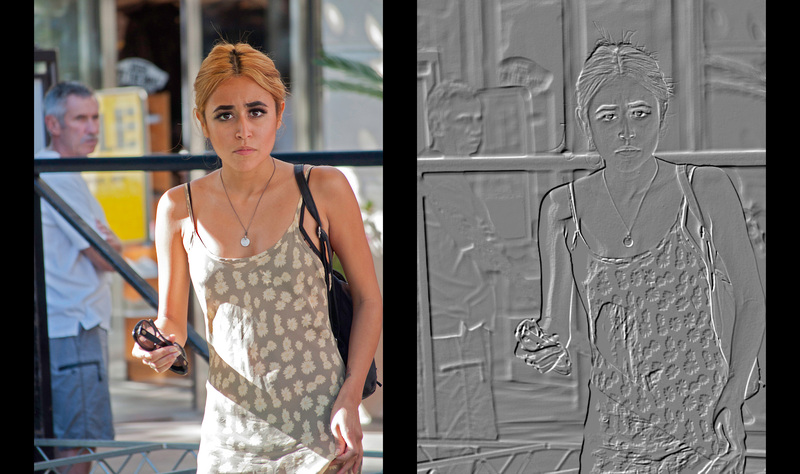 The original image was scanned at 4000dpi, yielding a 21megapixel image sampled at 16bits per pixel. This image was subsequently reduced in gamut (from ProPhotoRGB to sRGB) and size (to match the native iPhone4S resolution of 3264×2448) and bit depth (8bits per pixel) . The image processing was performed using Photoshop CS5.5 in a fully color-calibrated workflow. The source for the ‘real-world’ image was initially captured using a Nikon D5000 DSLR fitted with a Nikkor 200mm F2.8 prime lens (providing an equivalent focal length of 300mm compared to full-frame 35mm – the D5000 is a 2/3 size sensor [4288×2848]). The exposure was 1/250 sec @ f5.6 using camera raw format – no compression. That camera body captures in sRGB color space, and although outputs a 16bit per pixel format, the sensor is really not capable of anything more than 12 bits in a practical sense. The image was processed in Photoshop CS5.5 in a similar manner as above to yield a working image of 3264×2448, 8 bits per pixel, sRGB. These image pairs are what are used throughout my blog for analyzing filters, by importing into each camera app as a file. For the calibration chart, the same source image was used (Kodak Q60), this time as a precision print in 4″x5″ size. These prints were manufactured by Kodak under rigidly controlled processes and yield a highly accurate reflective target. (Most unfortunately, with the demise of Kodak, and film/print processing in general, these are no longer available. Even with the best of storage techniques, prints will fade and become inaccurate for calibration. It will be a challenge to replace these…) I used my iPhone4S to make the exposures under controlled lighting (special purpose full-spectrum lighting set to 5000°K). For the ‘real-world’ image, I wanted to stay with the same image of the woman for uniformity, and it provides a good range of test values. To accomplish that (and be able to take the pictures with the iPhone) was challenging, since the original shot was impossible to duplicate in real life. I started with the same original high resolution image (in Photoshop) in its original 16bit, high-gamut format. I then printed that image using a Canon fine art inkjet printer (Pixma Pro 9500 MkII), using a 16 bit driver, on to high quality glossy photo paper at a paper size of 13″ x 19″. At a print density of 267dpi, this yielded an image of over 17megapixels when printed. The purpose was to ensure that no subsampling of printed pixels would occur when photographed by the 8megapixel sensor in the iPhone. [Nyquist sampling theory demands a minimum of 2x sampling – 16megapixels in this case – to ensure that). I photographed the image with the same controlled lighting as used above for the calibration chart. I made one adjustment to each image for normalization purposes: I mapped the highest white level in the photograph (the clipped area on the subject’s right shoulder – which was pure white in the original raw image) to just reach pure white in the iPhone image. This matched the tonal range for each shot, and made up for the fact that even with a lot of light in the studio it wasn’t enough to fully saturate the little tiny iPhone sensor. No other adjustments of any kind were made. 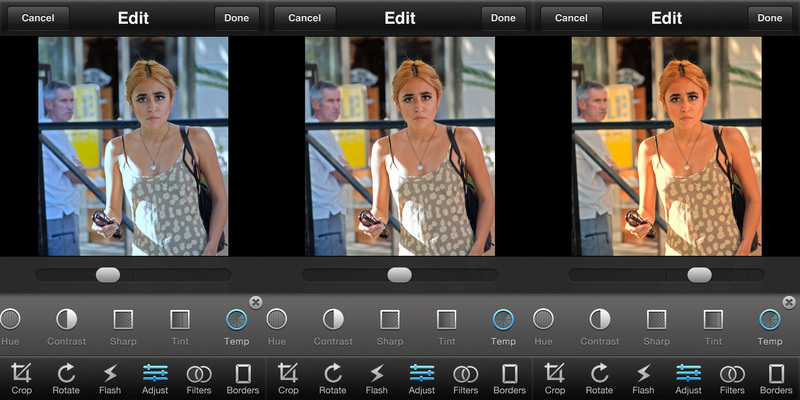 [This adjustment was carried out by exporting the original iPhone image to Photoshop to map the levels]. While even further steps could have been taken to make the process more scientifically accurate, the purpose here is one of relative comparison, not absolute measurement, so I feel the steps taken are sufficient for this exercise. The BW filter provides a monochrome adaptation of the original scene. 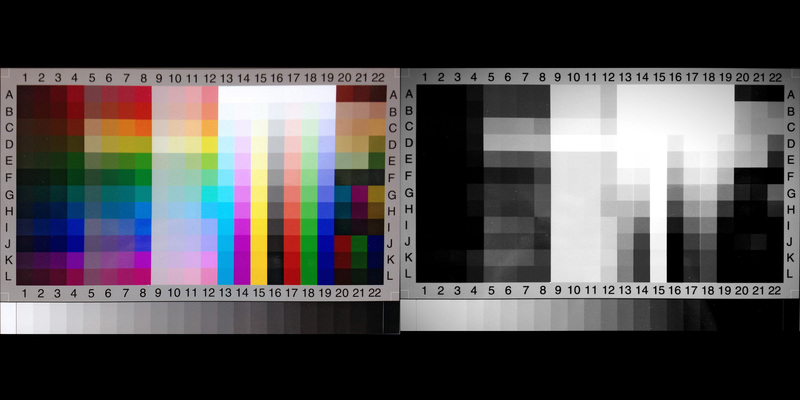 It is a high contrast filter, this can clearly be seen in the test chart, where columns 1-3 are solid black, as well as all grayscale chips from 19-22. Likewise, on the highlight end of the scale, chips 1-3 have no differentiation. The live image shows this as well, with a strong contrast throughout the scene. The Vintage filter is a warming filter that adds a reddish-brown cast to the image. It increases the contrast some (not nearly as much as the previous BW filter) – this can be seen in the chart in the area of columns 1-2 and rows A-J. The white and black ends of the grayscale are likewise compressed. Any cool pastel colors either turn white or a pale warm shade (look at columns 9-11). The live image shows these effects, note particularly how the man’s blue shirt and shorts change color remarkably. The increase in contrast, couple with the warming tint, does tend to make skin tones blotchy – note the subject’s face and chest. The Antique filter offers a large amount of desaturation, a cooling of what color remains, and an increase in contrast. Basically, only pinks and navy blues remain in the color spectrum, and the chart shows the clipping of blacks and whites. The live image shows very little saturation, only some dark blue remains, with a faint pink tinge on what was originally the yellow sign in the window. The Retro filter attempts to recreate the look of cheap film cameras of the 1960’s and 1970’s. These low quality cameras often had simple plastic lenses, light leaks due to imperfect fit of components, etc. 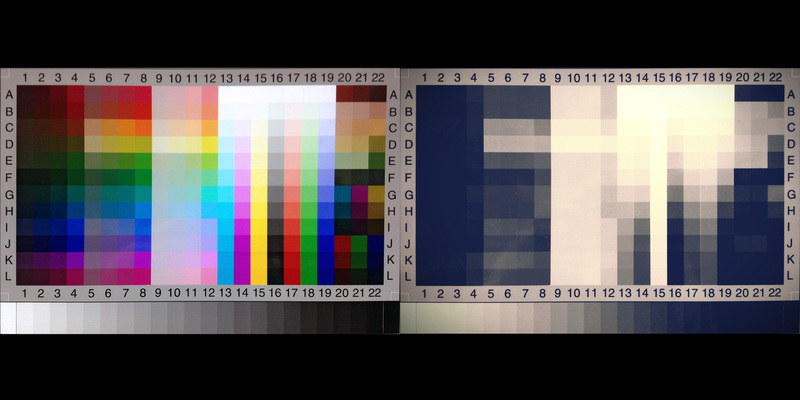 The noticeable chromatic aberrations of the lens and other optical ‘faults’ have now seen a resurgence as a style, and that is emulated with digital filters in this and others shown below. This particular filter shows a general warming, but with a pronounced red shift in the low lights. This is easily observable in the gray scale strip on the chart. 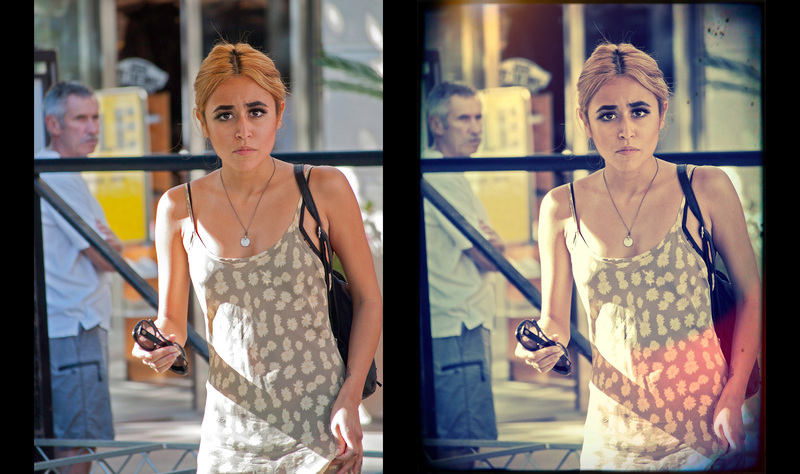 Nostalgia offers another variation on early low-cost film camera ‘look and feel’. As opposed to the strong red shift in the lowlights of Retro, this filter shifts the low-lights to blue. There is also an increase in saturation of both red and blue, notice that in the chart. The green column, #18, hardly has any change in saturation from the original, while the reds and blues show noticeable increases, particularly in the low-lights. The highlights have a general warming trend, showed in the area bounded by columns 13-19 and rows A-C. The live shot shows the strong magenta/red shift that this filter caused on skin tones. The Old filter applies significant shifts to the tonal range. It’s not exactly a high contrast filter, although that result is apparent in the ratio of the highlight brightness to the rest of the picture. 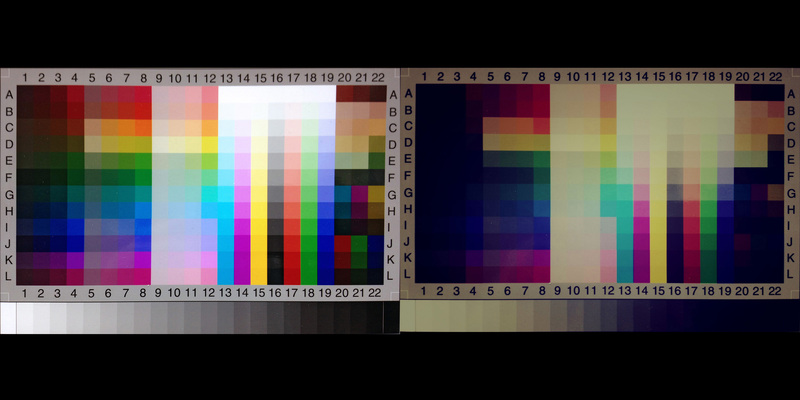 There is strong overall reduction in brightness – in the chart all differentiation is lost below chip #16. There is also desaturation, this is more obvious when studying the chart. 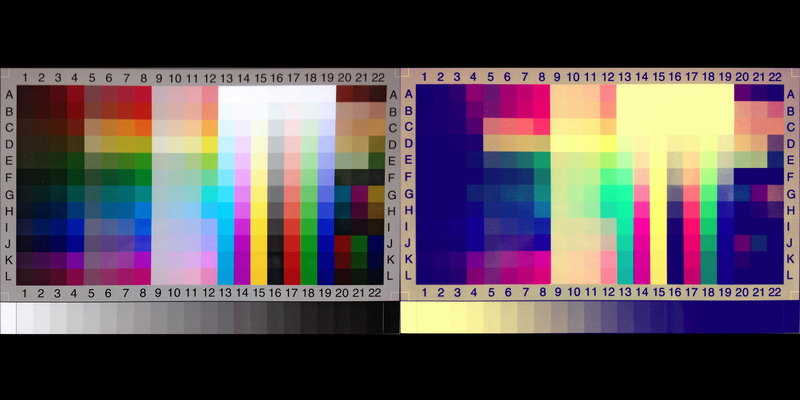 The highlights, like many of these filter types, are warmed toward the yellow spectrum. The Holga filter is named after the all-plastic camera of the same name – from Hong Kong in 1982. A 120 format roll-film camera, the name comes from the phrase “ho gwong” – meaning ‘very bright’. The marketing people twisted that phrase into HOLGA. The actual variations show a warming in the highlights and cooling (blue) in the lowlights. The contrast is also increased. In addition, as with many of the Camera Plus Pro filters, there is a spatial element as well as the traditional tonal and chromatic shifts: in this case a strong red tint in one corner of the frame. My tests appear to indicate that the placement of this (which corner) is randomized, but the actual shape of the red tint overlay is relatively consistent. Notice that in the chart the overlay is in the upper right corner, in the live shot it moved to lower right. There is also desaturation, this is noticeable in her skin, as well as the central columns of the chart. The Polaroid filter mimics the look of one of the first ‘instant gratification’ cameras – the forerunner of digital instant photography. The PLC look (Polariod Land Camera) was contrasty with crushed blacks, tended towards blue in the shadows, and had slightly yellowish highlights. This particular filter has a pronounced magenta shift in the skin tones that is not readily apparent from the chart – one of the reasons I always use these two different types of test images. The Hipster filter effect is another of the digital memorials to the original Hipstamatic camera – a cheap all plastic 35mm camera that shot square photos. Copied from an original low-cost Russian camera, the two brothers that invented it only produced 157 units. The camera cost $8.25 in 1982 when it was introduced. With a hand-molded plastic lens, this camera was another of the “Lo-Fi” group of older analog film cameras whose ‘look’ has once again become popular. The CameraPlusPro version shows pronounced red in the midtones, crushed blacks (see column 1-2 in the chart and chips #18 and below), along with increased contrast and saturation. In my personal view, this look is harsher and darker than the actual Hipstmatic film look, which tended towards raised blacks (a common trait of cheap film cameras, the backs always leaked a bit of light so a low level ‘fog’ of the film base always tended to raise deep blacks [areas of no light exposure in a negative] to a dull gray); a softer look (lower contrast due to raised blacks) and brighter highlights. But that’s purely a personal observation, the naming of filters is arbitrary at best, that’s why I like to ‘look under the hood’ with these detailed comparisons. The XPro filter as manifested by the CameraPlusPro team looks very similar to their Nostalgia version, but the XPro has highlights that are more white than the yellow of Nostalgia. The term XPro comes from ‘cross-process’ – what happens when you process film in the wrong developer, for instance developing E-6 transparency film in C-41 color negative chemistry. The effects of this process are highly random, although there is a general tendency towards high contrast, unnatural colors, and staining. In this instance, the whites are crushed a bit, blacks tend blue, and contrast is raised. The Crimson filter is, well, crimson! A bit overstated for my taste, but if you need a filter to make your viewers think of “The Shining” then this one’s for you! What more can I say. Red. Lots of it. The Sienna filter always makes me think of my early art school days, when my well-meaning parents thought I needed to be exposed to painting… (burnt sienna is a well-know oil pigment, an iron oxide derivative that is reddish-brown. My art instructor said “think tree trunks”.) Alas, it didn’t take me (or my instructor) long to learn that painting with oils and brushes was not going to happen in this lifetime. Fortunately I discovered painting with light shortly after that, and I’ve been in love with the camera ever since. The Sienna as shown here is colder than the pigment, a somewhat austere brown. The brown tint is more evident in the lowlights, the whites warm up just slightly. As in many of the CameraPlusPro filters, the blacks are crushed, which creates an overall look of higher contrast, even if the midtone and highlight contrast levels are unchanged (look at the grayscale in the chart). There is also an overall desaturation. Emerald brings us, well, green… along with what should now be familiar: crushed blacks, increased contrast, desaturation. The Bourbon filter resembles the Sienna filter, but has a decidedly magenta cast in the shadows, while the upper midtones are yellowish. 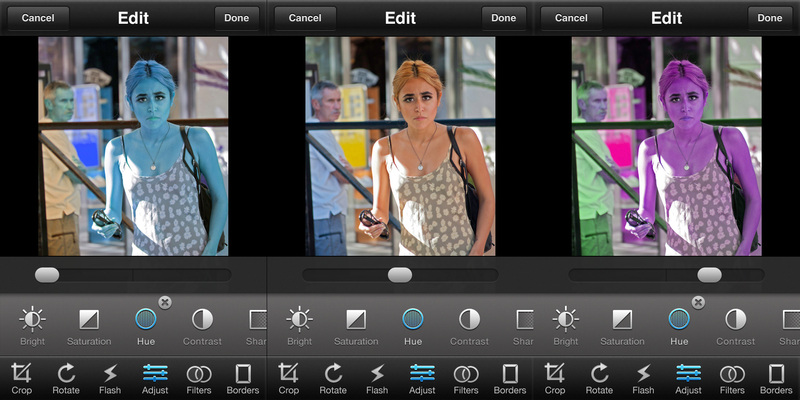 The lowered saturation is another common trait of the CameraPlusPro filters. The Washed filter actually looks more like ‘unwashed’ print paper to me.. Let me explain: before the world of digits descended on photography, during the print process (well, this applies to film as well but the effect is much better known in the printing process), after developing, stopping and fixing, you need to wash the prints. Really, really well. For a long time, like 30-45 minutes under flowing water. This is necessary to wash out almost all of the residual thiosulfate fixing chemical – if you don’t, your prints will age prematurely, showing bleaching and staining, due to the slow annihilation of elemental silver in the emulsion by the remaining thiosulfate. The prints will end up yellowed and a bit faded, in an uneven manner. In this digital approximation, the biggest difference is (as usual for this filter set) the crushed blacks. In the chemical world, just the opposite would occur, as the blacks in a photographic print have the highest accumulation of silver crystals (that block light or cover up the white paper underneath). 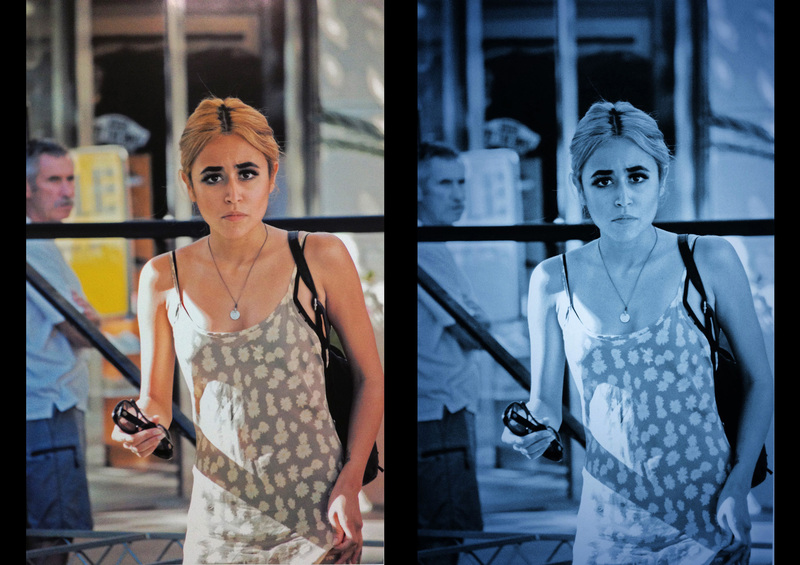 The other attributes of this particular filter are: strongly yellowed highlights, lowlights tend to blue, increased contrast and raised saturation. This Arctic filter looks cold! Unlike the true arctic landscape (which is subtle but has an amazing spectrum of colors), this filter is actually a tinted monochrome. The image is first reduced to black and white, then tinted with a cold blue. This is very clear by looking at the chart. It’s an effect. After looking so cold in the last shot, our subject is better when Warm. Slightly increased saturation and a yellow-brown cast to the entire tonal range are the basic components of this filter. 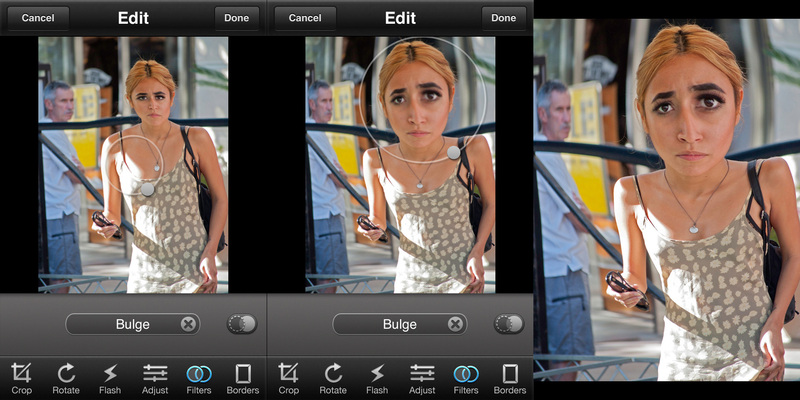 This app has 6 groups of edit functions: Crop, Rotate, Flash, Adjust, Filters and Borders. The first two are self-evident, and are more than adequately explained in the manual. The “how-to” of the remaining functions I will leave to the manual, what will be discussed here are examples of each variable in the remaining four groups. Flash – also known as “Digital Flash” – a filter designed to brighten an overly dark scene. Essentially, this filter attempts to bring the image levels up to what they might have been if a flash had been used to take the photograph initially. As always, this will be a ‘best effort’ – nothing can take the place of a correct exposure in the first place. The most frequent ‘side effects’ of this type of filter are increased noise in the image (since the image was dark in the first place – and therefore would have substantial noise due to the nature of CCD/CMOS sensors), raising the brightness level will also raise the appearance of the noise; and white clipping of those areas of the picture that did receive normal, or near-normal, illumination. 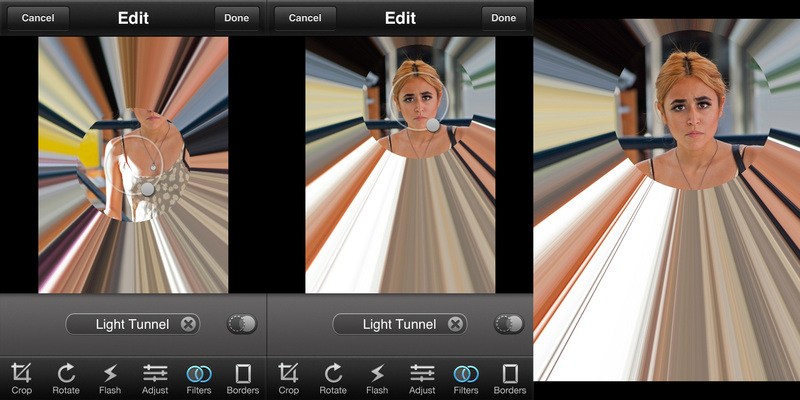 This app supports 3 levels of ‘flash’ [brightness elevation] – I call this ‘shirt-sizing’ – S, M, L. Below are 4 screen shots of the Flash filter in action: None, Small, Medium, Large. 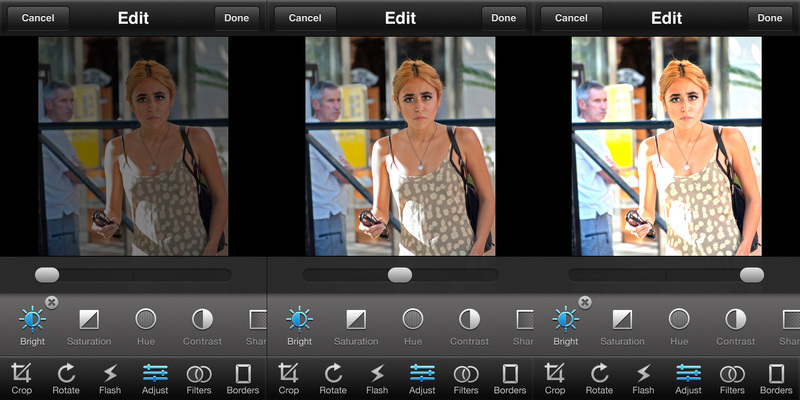 This filter attempts to be somewhat realistic – it is not just an across-the-board brightness increase. For instance, objects that are very dark in the original scene (such as her handbag or the interior revealed by the doorway in the rear of the scene) only are increased slightly in level, whiile midtones and highlights are raised much more substantially. 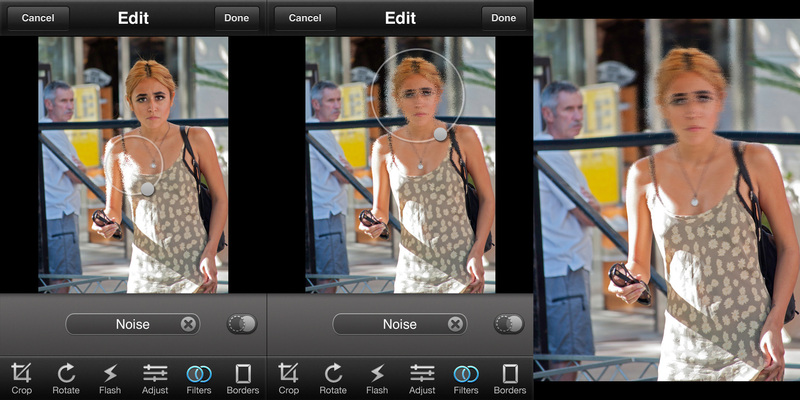 Adjust – there are 7 sub-functions within the Adjust edit function; Brightness, Saturation, Hue, Contrast, Sharpness, Tint and Color Temperature. Each function has a slider that is initially centered, moving it left reduces the named parameter, moving it right increases. Once moved off the zero center position, a small “x” on the upper right of the assoiciated icon can be tapped to return the slider to the middle position, effectively turning off any changes. Examples below for each of the sub-functions are shown. 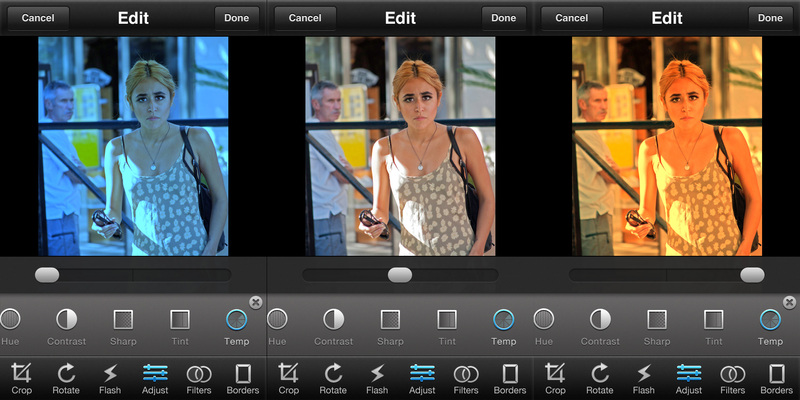 Filters – There are 45 image filters in the Edit section of the app. Some of them are similar or identical in function to the filters of the same name that were discussed in the Live Filter section above. These are contained in 5 groups: Nostalgia, Special, Colorize, Artistic and Distortion. The examples below are similar in format to the presentation of the Live Filters. The source images for these comparisons are imported files (see the note at the beginning of this section for details). The Coffee filter is rather well-named: it looks like your photo had weak coffee spread over it! You can see from the chart that, as usual for many of the CameraPlusPro filters, increased contrast, crushed blacks and desaturation is the base on which a subtle warm-brown cast is overlayed. The live example shows the increased contrast around her eyes, and the skin tones in both the woman and the man in the background have tended to pale brown as opposed to the original red/yellow/pink. The Retro Red filter shows increased saturation, a red tint across the board (highlights and lowlights), and does not alter the contrast – note all the steps in the grayscale are mostly discernable – although there is a slight blending/clipping of the top highlights. 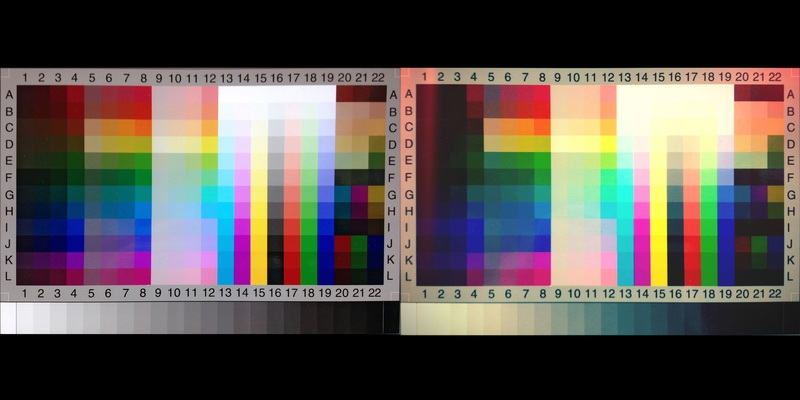 The overall brightness levels are raised from midtones through the highlights. The Vintage filter here in the Edit portion of the app is very similar to the filter of the same name in the Live Filter section. The overall brightness appears higher, but some of that may be due to the different process of shooting with a live filter and applying a filter in the post-production process. This is more noticeable in the live shot as opposed to the charts – a comparision of the “Vintage” filter test charts from the Live Filter section and the Edit section shows almost a dead match. This filter is a warming filter that adds a reddish-brown cast to the image. It increases the contrast some – this can be seen in the chart in the area of columns 1-2 and rows A-J. The white and black ends of the grayscale are likewise compressed. Any cool pastel colors either turn white or a pale warm shade (look at columns 9-11). The live image shows these effects, note particularly how the man’s blue shirt and shorts change color remarkably. The increase in contrast, coupled with the warming tint, does tend to make skin tones blotchy – note the subject’s face and chest. The Nostalgia filter, like Vintage above, is basically the same filter as the instance offered in the Live Filter section. The main difference is the Live Filter version is more magenta and a bit darker than this filter. Also the cyans tend green more strongly in this version of the filter – check out columns 12-13 in the chart. Some increased contrast, pronounced yellows in the highlights and increased red/blue saturation are also evident. 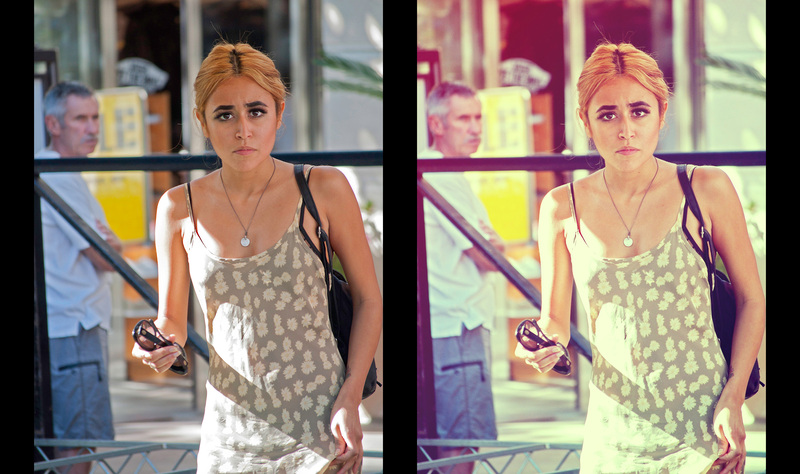 The Retro filter, as in the version in the Live Filter section, attempts to recreate the look of cheap film cameras of the 1960′s and 1970′s. These low quality cameras often had simple plastic lenses, light leaks due to imperfect fit of components, etc. The noticeable chromatic aberrations of the lens and other optical ‘faults’ have now seen a resurgence as a style, and that is emulated with digital filters in this and others shown below. This particular filter shows a general warming, but with a pronounced red shift in the low lights. This is easily observable in the gray scale strip on the chart. The Retro Green filter is a bit of a twist on Retro, with some of Nostalgia thrown in (yes, filter design is a lot like cooking with spices..) The lowlights are similar to Nostalgia, with a blue cast, the highlights show the same yellows as both Retro and Nostalgia, the big difference is in the midtones which are now strongly green. The 70s filter gives us some desaturation, no change in contrast, red shift in midtones and lowlights, yellow shift in highlights. The Antique filter is similar to the Antique Live Filter, but is much lighter in terms of brightness. 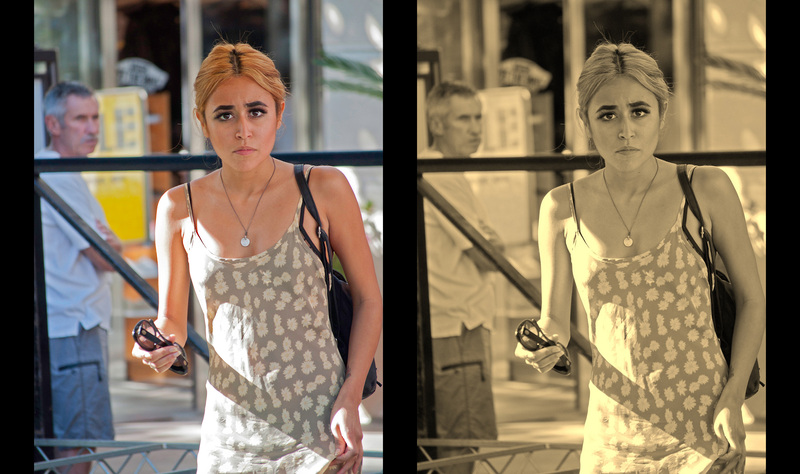 There is a large degree of desaturation, some increase in contrast, significant brightness increase in the highlights, and very slight color shifts at the ends of the grayscale: yellow in the highlights, blue in the lowlights. The Washed filter here in the Edit section is very different from the filter of the same name in Live Filters. The only real similarity is the strongly yellowed highlights. This filter, like many of the others we have reviewed so far, has a much lighter look (brightness levels raised), a very slight magenta shift, slightly increased contrast, enhanced blues in the lowlights and some increase in cyan in the midtones. The XPro filter in the Edit functions has a different appearance than the filter of the same name in Live Filters. 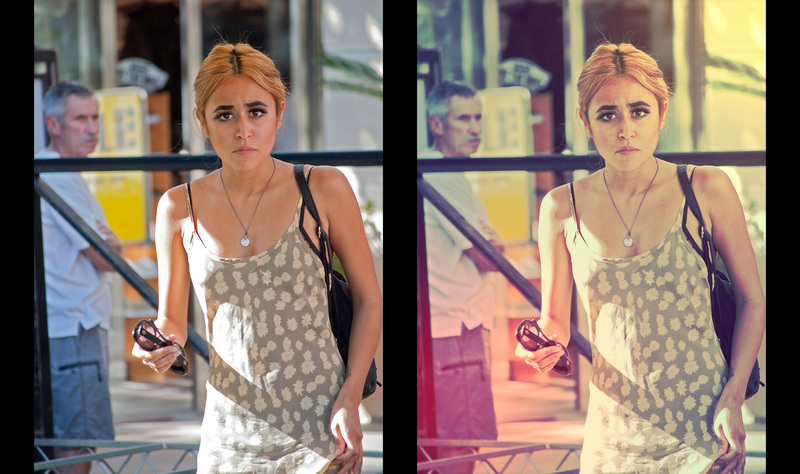 This instance of the digital emulation of a ‘cross-process’ filter is less contrasty, less magenta, and has more yellow in the highlights. The chart shows the yellows in the highlights, blues in the lowlights, and increased saturation. The live shot reveals the increased white clipping on her dress (due to increased contrast), as well as the crushed blacks (notice the detail of the folds in her leather handbag are lost). The Pop filter brings the familiar basic tonal adjustments (increased contrast, with crushed whites and blacks, an overall increase in midtone and highlight brightness levels) but this time the lowlights have a distince red/magenta cast, with midtones and highlights tending greenish/yellow. This is particularly evident in the live shot. Look at the black doorway in the original which is now very reddish in the filtered shot. The Lomo filter here in the Edit area is rather different than the same named filter in Live Filters. 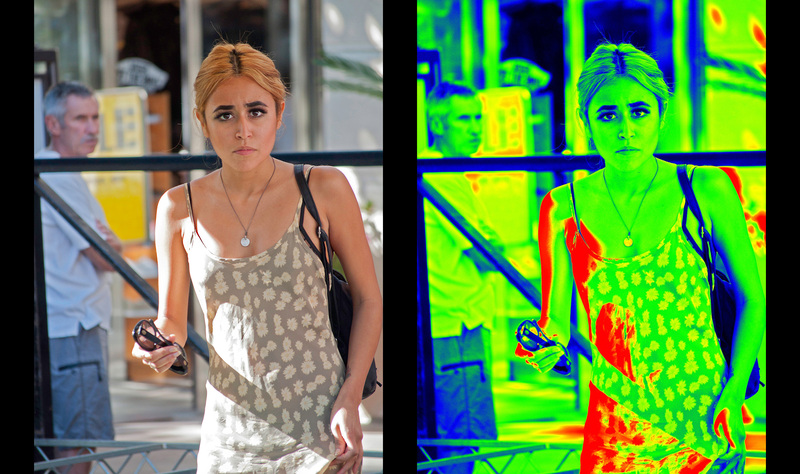 This particular instance shows increased contrast and saturation, yellowish warming in the highlights, and like some other CameraPlusPro filters, an added spatial effect (the red splotch – in this example the red tint is in the same lower right corner for both chart and woman – if the placement is random, then this is just coincidence – but… it makes it look like the lowlights in the grayscale chart are pushed hard to red: not so, it’s just that’s where the red tint overlay is this time…). Look at the top of her handbag in the live shot to see that the blacks are not actually shifted red. 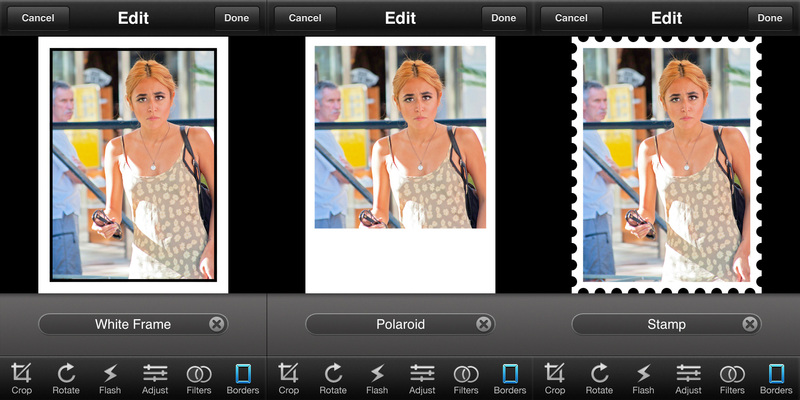 As with many other CameraPlusPro filters, the whites and blacks are crushed some – you can see on her dress how the highlights are now clipped. The Holga filter is one where there is a marked similarity between the Live Filter and this instance as an Edit Filter. This version is lighter overall, with a more greenish-yellow cast, particularly in the shadows. The vignette effect is stronger in this Edit filter as well. The Diana filter is another ‘retro camera’ effect: based on, wow – surprise, the Diana camera… another of the cheap plastic cameras prevalent in the 1960′s. The vignetting, light leaks, chromatic aberrations and other side-effects of a $10 camera have been brought into the digital age. In a similar fashion to several of the previous ‘retro’ filters discussed already, you will notice crushed blacks & highlights, increased contrast, odd tints (in this case unsaturated highlights tend yellow), increased saturation of colors – and a slight twist in this filter due to even monochrome areas becoming tinted – the silver pendant on her chest now takes on a greenish/yellow tint. The Polaroid filter here in the Edit section resembles the effects of the same filter in Live Filters in the highlights (tends yellow with some mild clipping), but diverges in the midtones and shadows. Overall, this instance is lighter, with much less magenta shift in the skin tones. 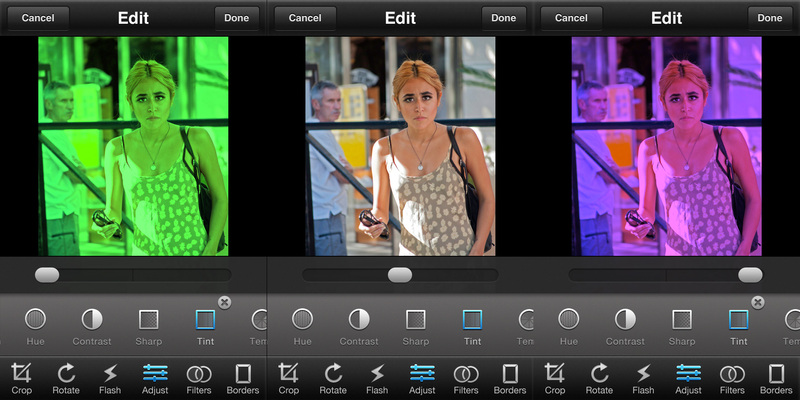 The contrast is not as high as in the Live Filter version, and the saturation is a bit lower. 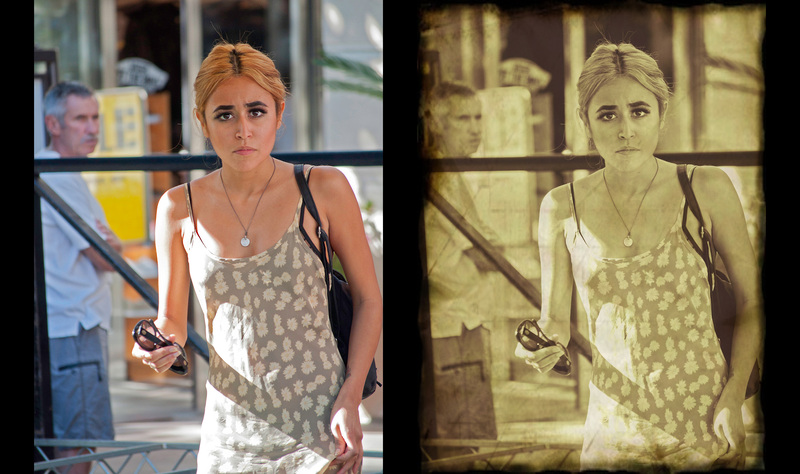 The Rust filter is really very similar to old-style sepia printing: this is a post-tint process to a monochrome image. In this filter, the image is first rendered to a black & white image, then colorized with a warm brown overlay. The chart clearly shows this effect. 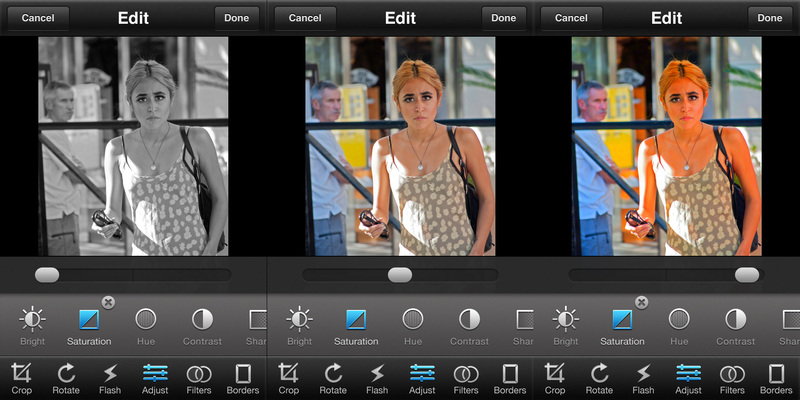 The Glamorize filter is a high contrast effect, with considerable clipping in both the blacks and the whites. The overall color balance is mostly unchanged, with a slight increase in saturation in the midtones and lowlights. Thr highlights on the other hand are somewhat desaturated. 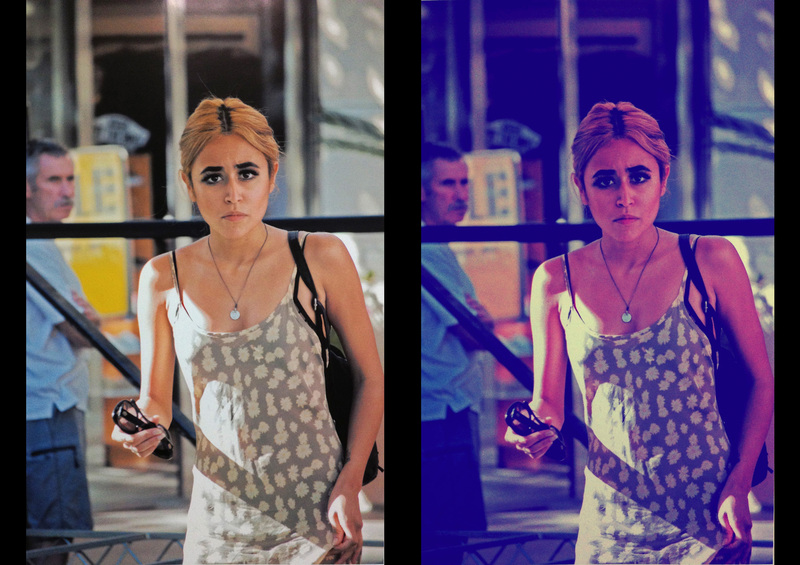 The Hipster filter follows the same pattern as other filters that have the same name in both the Live Filters section and the Edit section: the Edit version is usually lighter with higher brightness levels, less of a magenta cast in skin tones and lowlights, and a bit less contrast. Still, in relation to the originals, the Hipster has the typical crushed whites and blacks, raised contrast, and in this case an overall warming (red/yellow) of midtones and highlights. The Black & White filter here is almost identical to the effects produced by the same filter in the Live Filter section. A comparison of the chart images shows that. The live shots also render in a similar manner, with as usual the Edit filter being a bit lighter with slightly lower contrast. This is yet another reason to always evaluate a filter with at least two (and the more, the better) different types of source material. 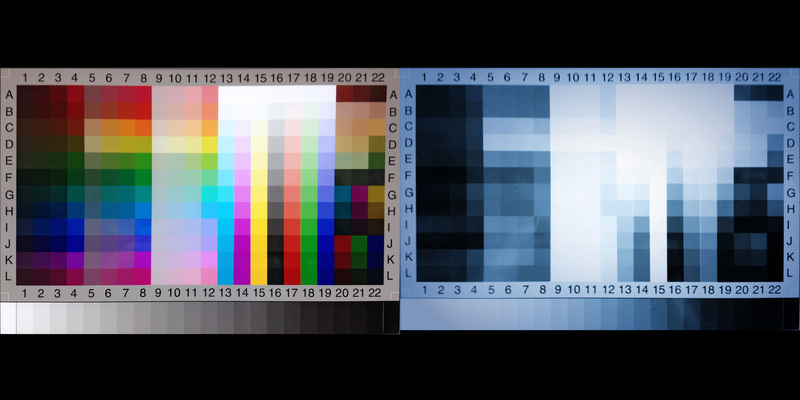 While digital filters offer a wealth of possibilities that optical filters never could, there are very fundamental differences in how these filters work. At a simple level, an optical filter is far more predictable across a wide range of input images than a digital filter. 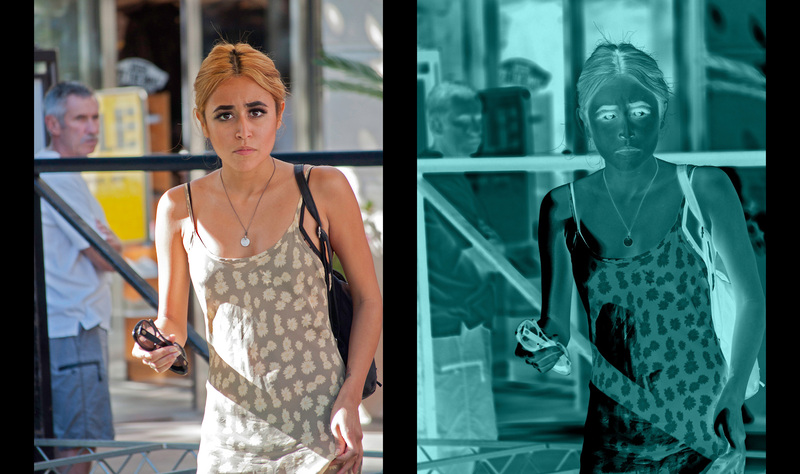 The more complex a digital filter becomes (and many of the filters discussed here that attempt to emulate a multitude of ‘retro’ camera effects are quite complex) the more unexpected results are possible. When you consider that a Wratten #85 warming filter is really very simple (an orange filter that essentially partially blocks bluish/cyan light) – therefore this action will occur no matter what the source image is. A filter such as Hipster, for example, attempts to mimic what is essentially a series of composited effects from a cheap analog film camera: chromatic aberration of the cheap plastic lens, spherical lens aberration, light leaks, vignetting due to incomplete coverage of the film (sensor) rectangle, focus anomalies due to imperfect alignment of the focal plane of the lens with the film plane, etc. etc. Trying to mimic all this with mathematics (which is what a digital filter does, it simply applies a set of algorithms to each pixel) means that it’s impossible for even the most skilled visual programmer to fully predict what outputs will occur from a wide variety of inputs. The Sepia filter is very similar to the Rust filter – it’s another ‘monochrome-then-tint’ filter. This time instead of a reddish-brown tint, the color overlay is a warm yellow. The Sunset filter brings increased brightness, crushed whites and blacks, increased contrast and an overall warming towards yellow/red. Looks like it’s attempting to emulate the late afternoon light. The Moss filter is, well, greenish… It’s a somewhat interesting filter, as most of the tinting effect is concentrated solely on monochromatic midtones. The chart clearly shows this. The live shot demonstrates this as well, the saturated bits keep their colors, the neutrals turn minty-green. Note his shirt, her dress, yellow sign stays yellow, and skin tones/hair don’t take on that much color. The Lucifer filter is – surprise – a reddish warming look. There is an overall desaturation, followed by a magenta/red cast to midtones and lowlights. A slight decrease in contrast actually gives this filter a more faded, retro look than ‘devilish’, and in some ways I prefer this look to some of the previous filters with more ‘retro-sounding’ names. The Faded filter offers a desaturated, but contrasty, look. Usually I interpret a ‘faded’ look to mean the kind of visual fading that light causes on a photographic print, where all the blacks and strongly saturated colors fade to a much lighter, softer tone. In this case, much of the color has faded, but the luminance is unchanged (in terms of brightness) and the contrast is increased, resulting in the crushed whites and blacks common to Camera Plus Pro filter design. The Warm filter is basically a “plus yellow” filter. Looking at the chart you can see that there is an across-the-board increase in yellow. That’s it. The Arctic filter is, well, cold. Like several of the other tinted monochromatic filters (Rust, Sepia), this filter first renders the image to a monochrome version, then tints it at all levels with a cold blue color. 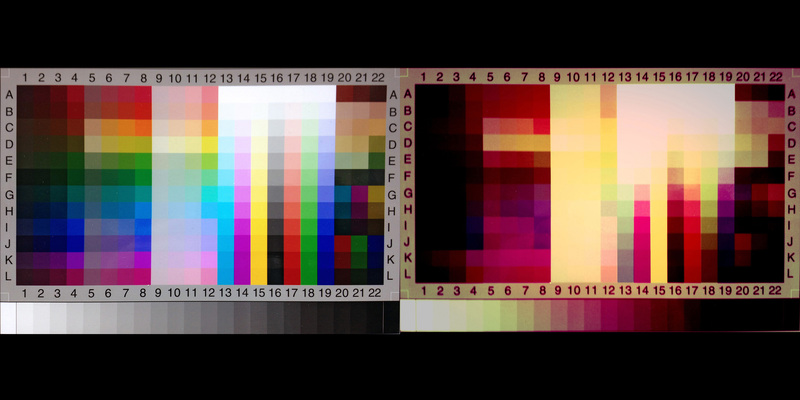 The Allure filter is similar to the Warming filter – an even application of a single color increase – in this case magenta. There is also a slight increase in contrast. The HDR filter is an attempt to mimic the result from ‘real’ HDR (High Dynamic Range) photography. Of course without true double (or more) exposures, this is not possible, but since some of the ‘look’ that some instances of HDR processing reveal show increased contrast, saturation and so on – this filter emulates some of that. Personally, I believe that true HDR photography should be indistinguishable from a ‘normal’ image – except that it should correctly map a very wide range of illumination levels correctly. A lot of “HDR” images tend to be a bit ‘gimicky’ with excessive edge glow, false saturation, etc. While this can make an interesting ‘special effect’ I think that it would better serve the imaging community if we correctly labeled those images as ‘cartoon’ or some other more accurate name – those filter side-effects really have nothing to do with true HDR imaging. Nevertheless, to complete the description of this filter, it is actually quite ‘color-neutral- (no cast), but does add contrast, particularly edge contrast; and significant vibrance and saturation. The Fantasy filter is another across-the-board ‘color cast’ filter, this time with an increase in yellow-orange. 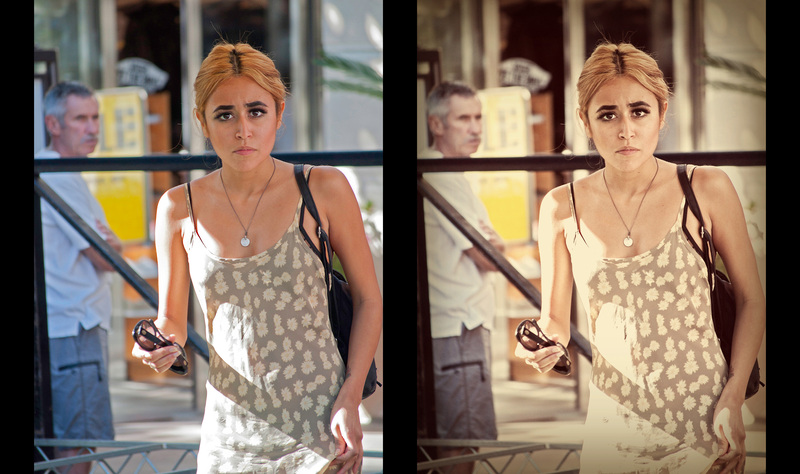 Virtually no change in contrast, just a big shift in color balance. The Vignette filter is a spatial filter, in that it really just changes the ‘shape’ of the image, not the overall color balance or tonal gradations. It mimics the light fall-off that was typical of early cameras whose lenses had inadequate covering power (the image rendered by the lens did not extend to the edges of the film). There is a tiny loss of brightness even in the center of the frame, but essentially this filter darkens the corners. 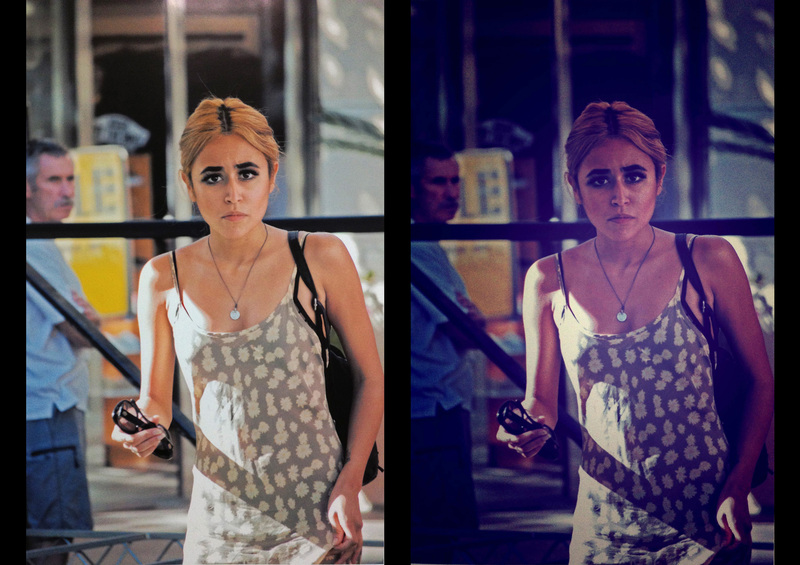 The Grunge filter is a combination filter: both a spatial and tonal filter. It first, like past filters that are ‘tinted monochromatic’ filters, renders the image to black & white, then tints it – in this case with a grayish-yellow cast. There is also a marked decrease in contrast, along with elevated brightness levels. This is easily evident from the grayscale strip in the chart. In the live shot you can see her handbag is now a dark gray instead of black. The spatial elements are then added: specialized vignetting, to mimic frayed or over-exposed edges of a print, as well as ‘scratches’ and ‘wrinkles’ (formed by spatially localized changes in brightness and contrast). All this combines to offer the look of an old, faded, bent and generally funky print. The Pop Art filter is very much a ‘special effects’ filter. This particular filter is based on the solarization technique. This process (solarization) is in fact a rather complex and highly variable technique. It was initially discovered by Daguerre and others who first pioneered photography in the mid-1800’s. The name comes from the reversal of image tone of a drastically over-exposed part of an image: in this case, pictures that included the sun in direct view. Instead of the image of the sun going pure white (on the print, pure black in the negative), the sun’s image actually went back to a light gray on the negative, rendering the sun a very dark orb in the final print. One of the very first “optical special effects” in the new field of photography. This is actually cause by halogen ions released within the halide grain by over-exposure diffusing to the grain surface in amounts sufficient to destroy the latent image. In negatives, this is correctly known as the Sabattier effect after the French photographer, who published an article in Le Moniteur de la Photographie 2 in 1862. The digital equivalent of this technique, as shown in this filter, uses image tonal mapping computation to create high contrast bands where the levels of the original image are ‘flattened’ into distinct and constant brightness bands. This is clearly seen in the grayscale strip in the chart image. It is a very distinctive look and can be visually interesting when used in a creative manner on the correct subject matter. The Grayscale filter is just that: the rendering of the original image into a grayscale image. The difference between this filter and the Black & White filters (in both Live Filters and this Edit section) is a much lower contrast. By comparing the grayscale strips in the original and filtered chart images, you can see there is virtually no difference. The Black & White filters noticeably increase the contrast. The Emboss filter is another highly specialized effects filter. As can be seen from the chart image, the picture is rendered to a constant monochrome shade of gray, with only contrasting edges being represented by either an increase or decrease in brightness. This creates the appearance of a flat gray sheet that is ‘stamped’ or embossed with the outline of the image elements. High contrast edges are rendered sharply, lower contrast edges are softer in shape. Reading from left to right, a transition from dark to light is represented by a dark edge, from light to dark is shown as light edge. 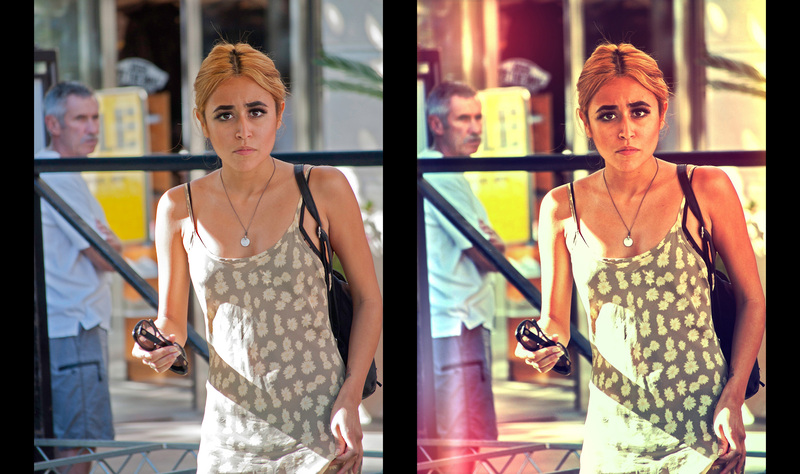 Since each of these Edit filters has an intensity slider, the effect’s strength can be ‘dialed in’ as desired. I have shown all the filters up to now at full strength, for illustrative purposes. Here I have included a sample of this filter at a 40% level, since it shows just how different a look can be achieved in some cases by not using a filter at full strength. The Xray filter is yet another ‘monochromatic tint’ filter, with the image first being rendered to a grayscale image, then (in this case) undergoing a complete tonal reversal (to make the image look like a negative), then finally a tint with a dark greenish-cyan color. It’s just a look (since all ‘real’ x-ray films are black and white only), but I’m certain at least one of the millions of people that have downloaded this app will find a use for it. The Heat Signature filter is the final filter in this Artistic group. 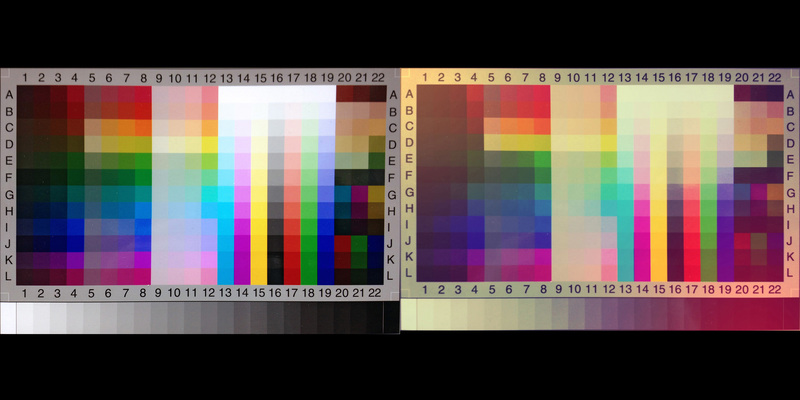 It is illustrative of a scientific imaging method whereby infrared camera images (that see only wavelengths too long for the human eye to see) are rendered into a visual color spectrum to help illustrate relative temperatures of the observed object. In the real scientific camera systems, cooler temperatures are rendered blue, the hottest parts of the image in reds. In between temperatures are rendered in green. Here, this mapping technique is applied against the grayscale. Blacks are blue, midtones are green, highlights are red. The geometric distortion filters are presented differently, since these are spatial filters only. 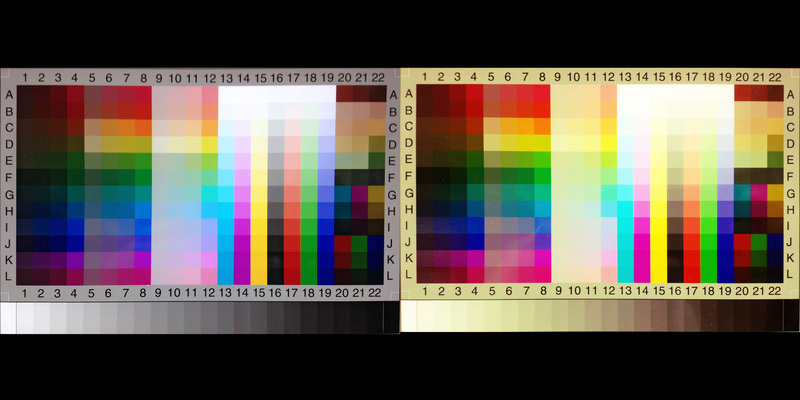 There is no need, nor advantage, to using the color chart test image. I have presented each filter as a triptych, with the first image showing the control as found when the filter is opened within the app, the second image showing a manipulation of the “effects circle” (which can be moved and resized), and the third image is the resultant image after applying the filter. There are no intensity sliders on the distortion filters. The Center Offset filter ‘pulls’ the image to the center of the circle, as if the image was on an elastic rubber sheet, and was stretched towards the center of the control circle. The Pixelate filter distorts the image inside of the control circle by greatly enlarging the quantization factors in the affected area, causing a large ‘chunking’ of the picture. This renders the affected area virtually recognizable – often used in candid video to obfuscate the identity of a subject. The Bulge filter is similar to the Center Offset, but this time the image is ‘pulled into’ the control circle, as if a magnifying fish-eye lens was applied to just a portion of the image. 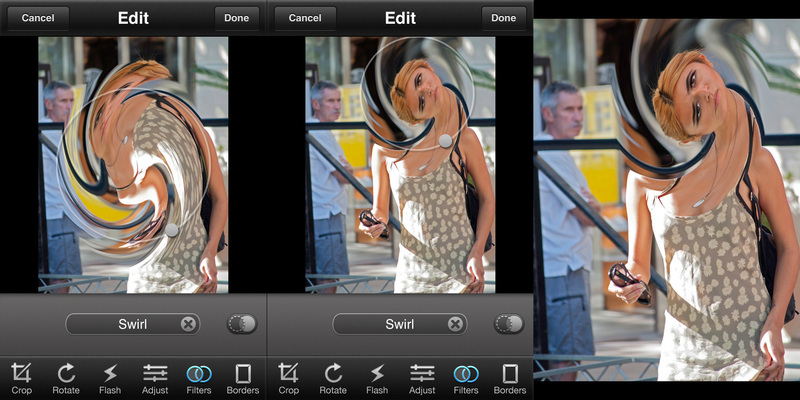 The Squeeze filter is somewhat the opposite of the Bulge filter, with the image within the control circle being reduced in size and ‘pushed back’ visually. The Noise filter works in a similar way to the Pixelate filter, only this time large-scale noise is introduced, rather than pixelation. The Fish Eye filter mimics what a ‘fish eye’ lens might make the picture look like. There is no control circle on this filter – it is a fixed effect. The center of the image is the center of the fish-eye effect. In this case, it’s really not that strong of a curvature effect, to me it looks about like what a 12mm lens (on a 35mm camera system) would look like. If you want to see just how wide a look is possible, go to Nikon’s site and look for examples of their 6.5mm fisheye lens. That is wide! 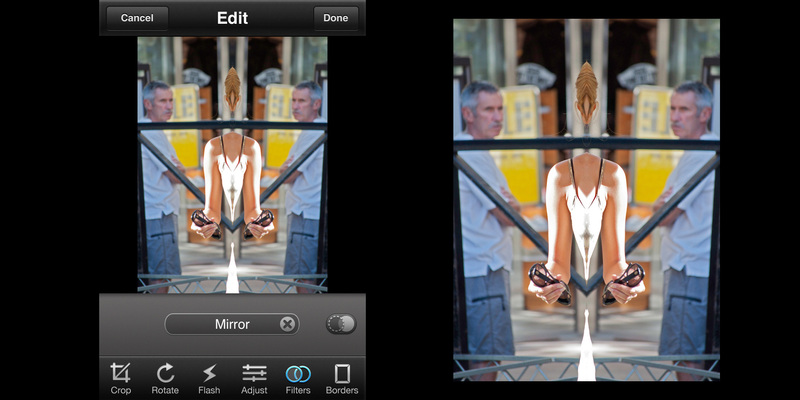 The Mirror filter divides the image down the middle (vertically) and reflects the left half of the image onto the right side. There are no controls – it’s a fixed effect. Ok, that’s it. Another iPhone camera app dissected, inspected, respected. Enjoy.